Just a short walk from Parliament House in Canberra is a rich wetland reserve which always seems to deliver. Both male and female Pink-eared Ducks (Malacorhynchus membranaceous) have a rather inconspicuous pink patch of feathers behind the eye. But it is the beak that is truly eye-catching! 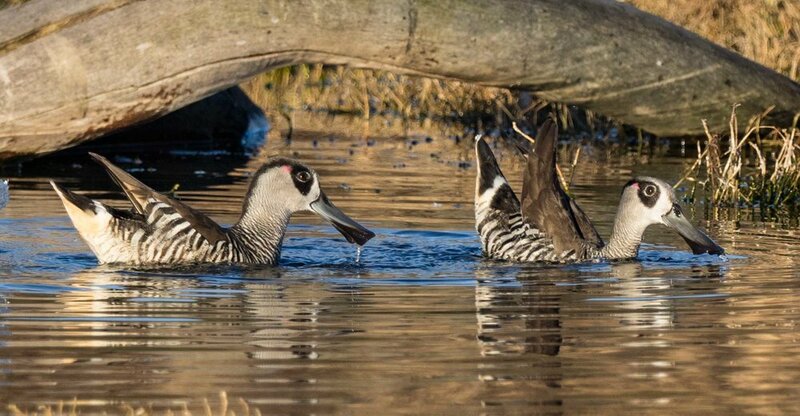 Pink-eared Ducks are quite a common species, widespread across Australia. They are nomadic and we have only encountered them occasionally, and only ever in small numbers. It was a delight, therefore, to watch a pair of these bizarre-looking birds feeding. The weird bill is a specialisation for filter-feeding. The duck draws water in through the tip and expels it out the sides, straining out the tiny invertebrates that form the bulk of their diet. And we were treated to a fine display of 'vortexing'. The two birds were circling constantly, heads down and clearly feeding. Reportedly, this particular feeding behaviour generates a small whirlpool, concentrating their tiny, planktonic food into a central water column. And other birds were taking advantage of the vortex. The Hoary-headed Grebes were the most brazen, but this Eurasian Coot also appeared to profit from feeding at the edge of the whirlpool. Although the sexes are similar, my guess is that the larger bird on the left is the male. When not feeding, he was following the other bird with apparent interest. And the upraised tail of the female(?) suggested interest on her part too! The second weird species on the lagoon was another bird we don't see often. Australasian Shovelers (Anas rhynchotis) are shy and typically feed at night. Australasian Shoveler (Anas rhynchotis) - the female (left) is superficially similar to a Grey Teal ... until you see the beak! The male here is in breeding plumage. The male shovelers were in fine breeding plumage and each female had an attentive male in tow. Female Australasian Shoveler, closely accompanied by a male. Like the Pink-eared Ducks, Australasian Shovelers are filter-feeders, swimming with their huge beaks submerged to skim invertebrates from just below the surface. The 4-5 birds we watched were also dabbling, often as synchronised pairs.